Tuesday, 3 July was my last day in Greece. It was as perfect as I could have hoped. 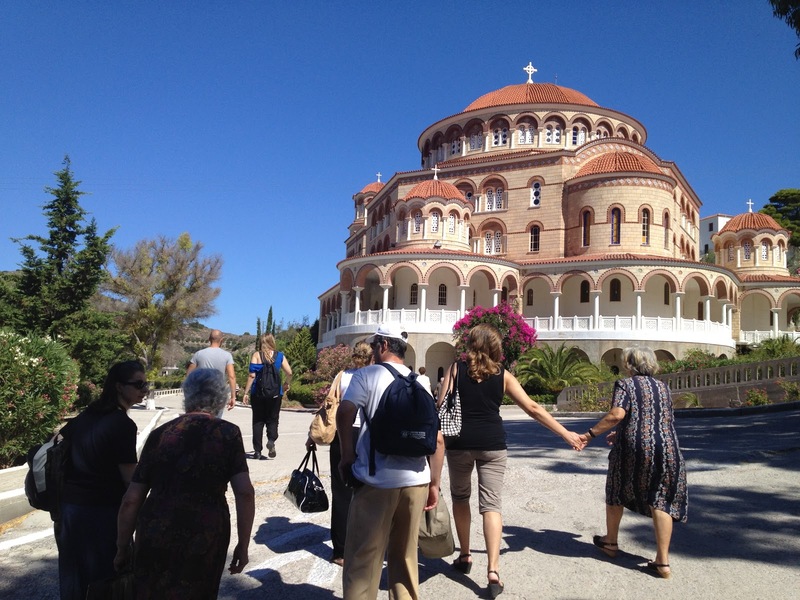 I visited Aegina to venerate the holy relics of St. Nektarios. St. Nektarios was a recent saint. He was a bishop in northern Africa, where we suffered much from the lies of his brother bishops. 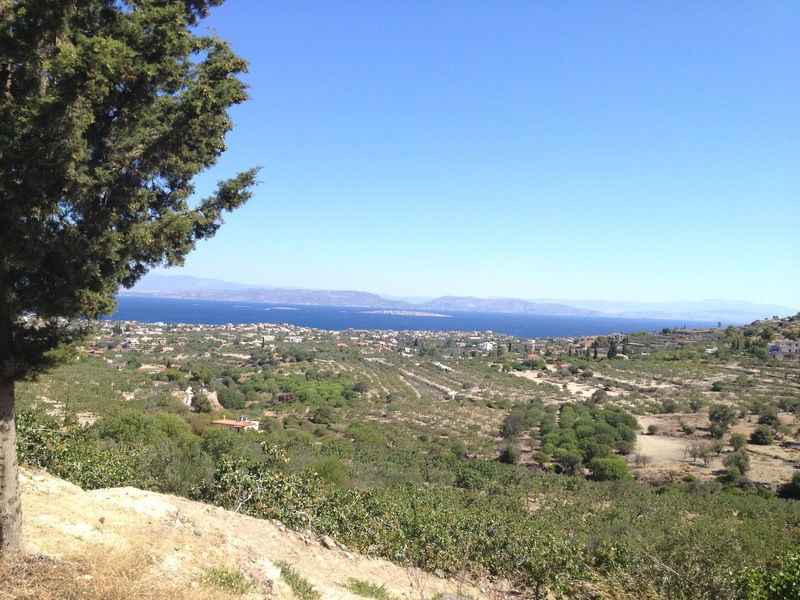 He came to Aegina where he founded a monastery. 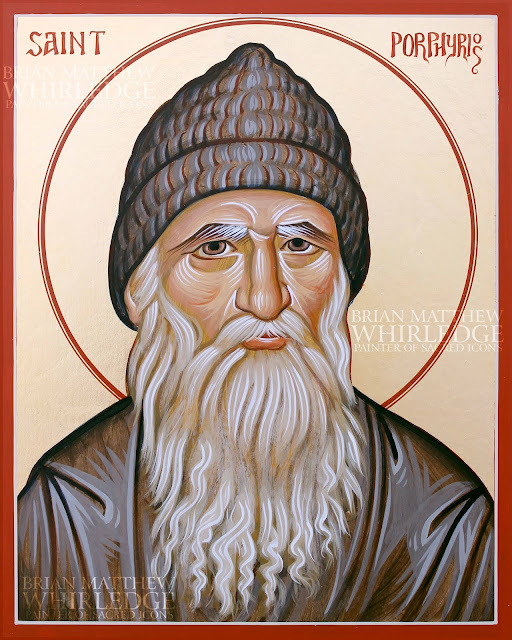 He is well known as a wonderworker and healer. Fotis and I woke up at 7. First, I looked at the ferry schedule. A fast boat left at 8:50. This should be doable. Fotis treated me to a traditional Greek breakfast...a coffee and a cigarette. After breakfast, we rode the metro to Pireaus, where we bought our tickets and arrived at the dock with 10 minutes to spare. The boat docked and unloaded, and the new passengers boarded. 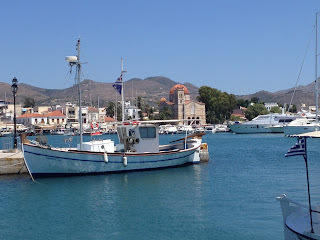 The hydrofoil went quite fast and took us to the island of Aegina in half an hour. Aegina is a quaint island close to Athens. 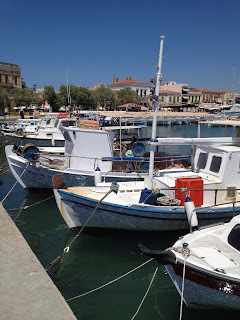 The town has beautiful buildings and countless boats, each named after a saint or feast. 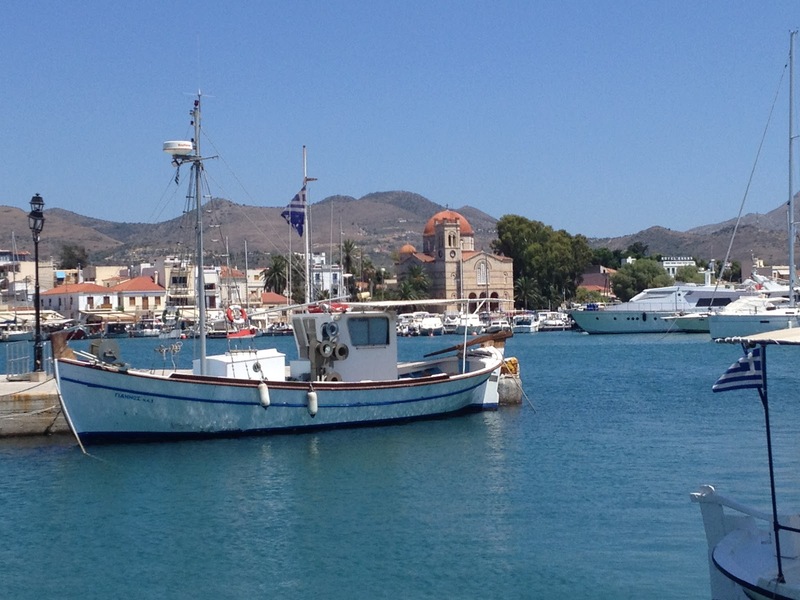 When St. Nekatrios was canonized, the port of Aegina was so packed with pilgrims that there was concern that the piers would sink. The first order of business was determining transportation to St. Nektarios. There was a bus leaving in 30 minutes. We found a bakery and bought a couple of pastries for a more substantial breakfast. 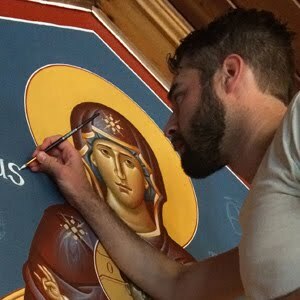 Fotis called a client for a website design, I called Arvanitis to schedule one last lesson, and finally Fotis called his mother to share the excitement of visiting St. Nektarios. "Most kids grow up with Spiderman," Fotis explained to me. "I grew up with St. Nektarios. I have never come here before...Thank you." 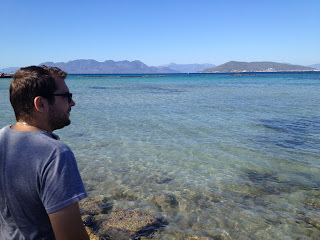 While we were waiting for the bus, we took off our shoes and waded in the crystal clear Saronic Gulf. We boarded the bus with more than a dozen other people. The bus wound its way up the mountain from the port. The bus was older than the Athens buses (everything there was new for the 2004 Olympics). Fotis said this bus was made in Thessaloniki. We passed many farm chapels just as in Naxos. Fotis explained that most of these chapels are dedicated to St. Elias (Elijah). There are also many shrines along the road that look like a tiny church on a post (not unlike a mailbox) which are usually placed where someone died in a car accident. The huge church of St. Nektarios was visible from quite a distance. The bus stopped and emptied entirely. We entered the huge church, which is still under construction. There is scaffolding in the dome for the iconographers to work. The iconostas is hand carved wood, with a pulpit above the royal doors. 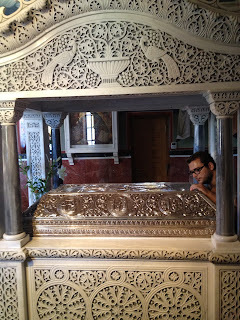 The relics of the saint are in a silver reliquary in a side chapel. We venerated them, said prayers, and took some photos. Somehow Fotis knew that this was not all. We ascended many flights of winding switchback stairs lined with beautiful flowers to the monastery proper. St. Nektarios founded this monastery in the early 20th century. 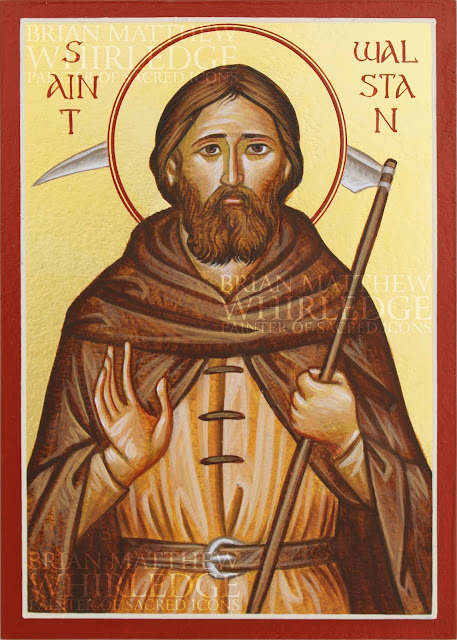 The church is new since his canonization, but much of the monastery remains as he knew it. 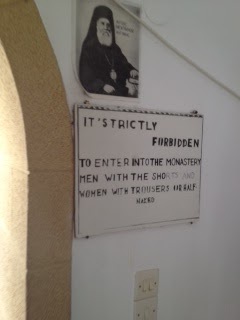 The gate of the monastery told the dress code. 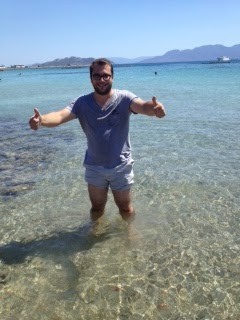 Fotis' shorts were not so strictly forbidden since he is Greek and not a tourist. 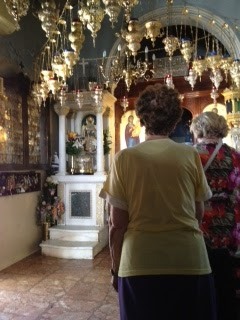 In the monastery, we found the small chapel where St. Nektarios served liturgy. 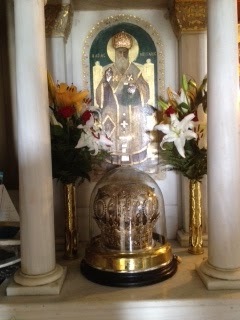 His holy skull is enshrined here inside a silver mitre. At least three hundred lamps adorn the ceiling. 2. St. Nekatarios' house was open for visiting. In his bedroom are dozens of icons and some personal effects, most notably his prayer rope. After venerating his head one last time, we returned to the bus stop. We climbed the stairs back to the monastery and found his house. It is preserved exactly how he had it: his books in the bookshelf and his family photos on the walls. At the bus stop, a quite obese gypsy was selling nuts from the back of his moped. Fotis did not take the offered free sample and cautioned me to do the same. We talked with a couple of yia yias at the bus stop. Fotis was excited to introduce me and they were excited to meet me, an American convert to Orthodoxy. We rode the bus back to Aegina town. 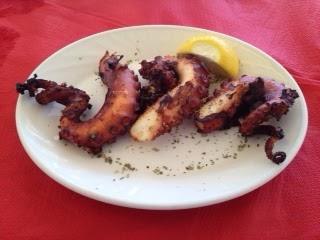 For my last day in Greece, I wanted seafood, especially since I was on an island. We found a waterfront taverna. I ordered grilled octopus. Fotis made sure it was fresh and was satisfied when the owner told him it was caught yesterday. The octopus was perfection. After lunch, we still had 2 hours before the boat would take us back to Pireaus. We went to the beach where we waded and skipped stones. This was the first time Fotis has been in the sea in 2 years. We took the boat back to Pireaus, where we parted ways: Fotis took a bus to his apartment in Egaleo, and I took the metro back to the center of Athens. I went a few extra stops to visit St. Nicholas Planas. They had found my icons and returned them to me. I got the icon of St. Philothei from my apartment and went to the metropolis one last time. I found a priest who was quite happy to bless her icon over her holy relics. It was emotional to leave Saints Gregory and Philothei. It was like saying goodbye to dear friends. I cleaned and packed before my lesson with Arvanitis. I made the 25 minute trek one last time, and got one last frappe. Along the way, out of five million people in Athens, I ran into Lycourgos Angelopoulos who was glad to see me. 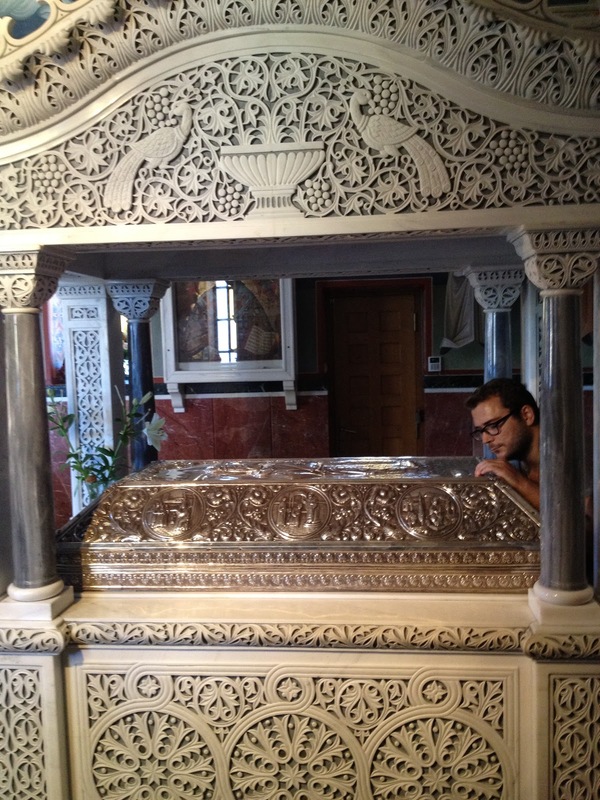 I explained that this was my last day in Greece, what an honor it was to sing at St. Irene, and he said farewell. The lesson of course was very good. We continued to study ornaments and sang some hymns in English. After the lesson, we talked for about half and hour. I gave him a bottle of wine and he gave me a few CDs of his choir and of another choir singing hymns that he composed. We exchanged a Christian kiss. I arrived at my apartment just in time for Fotis Dionysopoulos to check me out of the apartment. There were no problems, and he hoped to see me again in Athens. Soon after, Fotis Oikonomou arrived. He offered to hang out and walk with me to the bus to the airport. He didn't think it would be safe to walk by myself at 3 a.m. carrying all of my baggage. 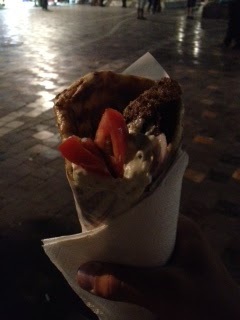 We went out for some souvlaki, which we ate in monastiraki square. We watched people mill about under the acropolis. On the way back to my apartment, we stopped by Panagia Kapnikarea to listen to a street musician. He was quite talented: he played American folk/rock songs with a strong reggae influence. Nearby a juggler performed. 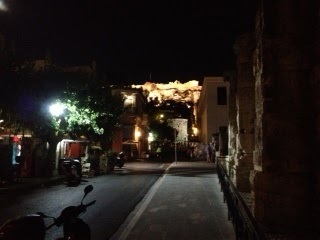 I caught one last glimpse of the acropolis.